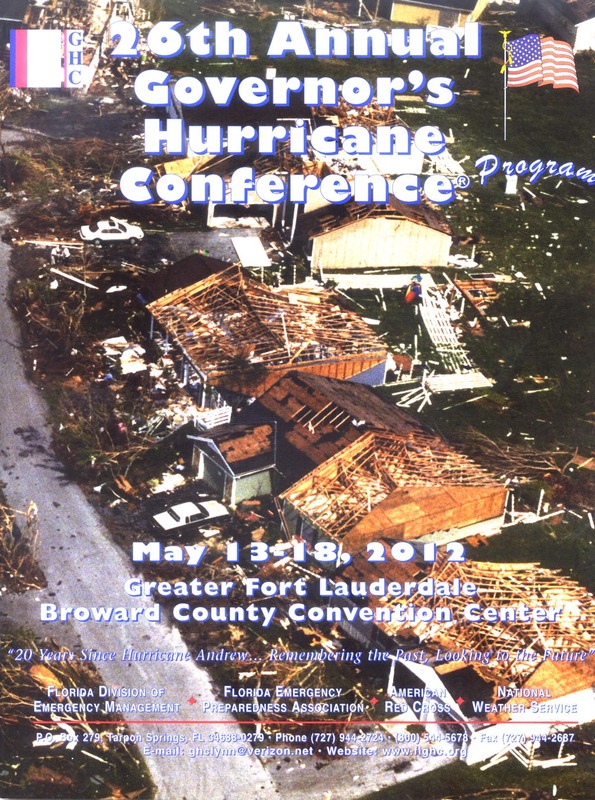 Under the theme “20 Years Since Hurricane Andrew…Remembering the Past, Looking to the Future” the 26th Annual Governor’s Hurricane Conference got under way this 13 May 2012 at the Greater Fort Lauderdale Broward County Convention Center. The event which is co-sponsored by the Florida Division of Emergency Management, the Florida Emergency Preparedness Association, the American Red Cross and the National Weather Service will conclude on Friday 18 May 2012. While a comprehensive treasure of training sessions, for emergency management practitioners, has been offered from Monday through Wednesday morning, the conference was officially inaugurated this afternoon Wednesday 16 May 2012 in a general session that include keynote presentations by Bryan Koon, Director Florida Division of Emergency Management, Bill Read, Director of NOAA National Hurricane Center, and a panel discussion moderated by Bryan Norcross, from the Weather Channel, Max Mayfield, former Director of the National Hurricane Center, and Frank Koutnik from Disaster Strategies and Ideas Group, among others. During the opening general session the announcement was made that 1350 registered participants plus 400 registered exhibitors are attending this years event. Quite good participation indeed, especially in these times of shrinking budgets and restricted travel policies. Ricardo A. Alvarez will be one of the speakers in one of several concurrent workshops taking place on Thursday 17 May; under the general subject of Recovery and Mitigation the workshop is titled Current Trends in Mitigation of Essential Facilities, and will focus of recent significant changes to the Florida Building Code and the incorporation of standard ASCE-7-10 into the code while highlighting wind retrofit trends, storm surge issues and best practices. The other two speakers in this session are Jeff Robinson, CEO of Hurricane Protection Industries LLC, of Miramar, Florida, and Danny Kilcollins, Planning Manager with the Florida Division of Emergency Management, Tallahassee, Florida. Moderating the session will be Keira DeArmas, Marketing Coordinator for Hurricane Protection Industries, LLC. The session is scheduled this Thursday 17 May 2012 from 3:30 to 5:00 p.m. in room Palm A. For those who are interested, you can view a PDF version of the slides used by Ricardo A. Alvarez to illustrate his presentation by clicking on the link that follows: STORM SURGE presentation2. These slides along with an abstract of key points will be posted on this site under CONFERENCES AND PRESENTATIONS on the banner menu above.